The early history of the West End Watch Co. is rather difficult to piece together, so don't be surprised if this page is subject to change! In compiling the following history I have drawn on Kathleen Pritchard's "Swiss Timepiece Makers 1775 - 1975", Karl Kochmann's "Clock and Watch Trademark Index of European Origin" and the judgment of the Mumbai High Court in the case of The West End Watch Co. vs The Berna Watch Co. on 22 November, 1910. Foundation of The West End Watch Co. In 1864, Alcide Constant Droz and Henry Perret of St. Imier in the Swiss Canton of Berne founded the watchmaking company Droz and Perret. This company subsequently went through many changes of name and registration, and registered many trade marks. In 1883 the company changed its registered name to Alcide Droz & Fils (Alcide Droz and Sons). Two of the sons were the brothers Louis, the elder, and Constant. The firm was recorded as makers of watches, specialising in waterproof (imperméable) watches. They registered a trademark of a flying eagle carrying a watch in its beak, surrounded by the words "Imperméable Brevete Dans Tous Pays" (Waterproof Patented in All Countries). On 16 October 1885 they registered a trademark of an eagle carrying a watch in its beak with above it the name "West End Watch". In 1884 a watch business was started in Bombay by Alcide Droz & Fils and Arnold Charpie. Some reports say that Charpie was the Indian representative of Droz, but I haven't found anything to substantiate this. The firm was evidently a joint venture between Charpie and Alcide Droz & Fils, with the intention of mainly, but not exclusively, importing watches manufactured at the St Imier factory. In 1887 Alcide Droz & Fils underwent another change of name, becoming Droz & Cie (Droz and Co.). Also in 1887, Arnold Charpie retired from the Bombay firm, and it became wholly owned by Droz & Cie. And also in the same year of 1887, the Bombay firm was renamed the West End Watch Co. And finally, also in 1887, Alcide Droz & Fils patented a trademark of a bear and flag with the word Berna, and also registered "West End Watch Co." on a movement. I think these events, all taking place in the same year, were all connected. The name of the Bombay company before the retirement of Arnold Charpie is not known, but it was evidently not The West End Watch Co. It appears likely that when Charpie retired in 1887 and Droz & Cie took over completely, they took the opportunity to rebrand the company The West End Watch Company, using the trademark name that they had already registered in 1885. There is a story that after the creation of the United International Bureaux for the Protection of Intellectual Property, Arnold Charpie decided to add a Helvetia figure, as appeared on Swiss coins, as a trademark, but that this caused a problem because Muslims reject representations of the human form. The story goes that Charpie ordered replacement dials bearing the name West End Watch Company. It is said that this was because he always stayed in and enjoyed the West End on his visits to London. However, as the United International Bureaux for the Protection of Intellectual Property was not created until 1893, some six years after Charpie had retired and eight years after Alcide Droz & Fils had registered the West End Watch trademark, this part of the story at least must be apocryphal. The West End Watch Co. remained a wholly owned subsidiary of Droz & Cie until 1891, when Jacques-Arnold Amstutz became a partner. In 1893, The West End Watch Cie. was listed as a brand of Droz & Amstutz, St Imier; a branch of a Bombay firm of the same name. In 1895 the Indian branch was named West End Watch Co., Droz & Amstutz, and in 1898 this was changed to West End Watch Co., Droz, Amstutz & Cie. It seems that at some stage in the early 1890s the two Droz brothers separated their business interests. Constant Droz joined up with Jacques-Arnold Amstutz in India, forming a company called Droz and Amstutz, and Louis Droz remained at the factory in St Imier with the company Droz & Cie. In 1904 Droz & Cie, the exclusive owners of the St. Imier Factory, got into financial difficulties and converted their manufacturing business into a Joint Stock Company under the name of the Fabrique d'Horlogerie Berna. The West End Watch Co. supported the flotation by taking up a large number of shares in the new Company. At the same time, Droz & Cie sold their interest in the West End Watch Co. to Jacques-Arnold Amstutz and Constant Droz. By virtue of their large shareholding in the new company, Constant Droz and Jacques-Arnold Amstutz were able to insist on a monopoly of all the products the joint stock company Fabrique d'Horlogerie Berna sent to India for a period of ten years. But by 1907 the joint stock company Berna was itself in trouble, and in December went into liquidation. It seems that at least part of the reason for this was a lack of orders from The West End Watch Co., who had complained about the watches supplied by Berna and began importing watches largely from other manufacturers, while they ceased giving orders to the St. Imier factory. The West End brand gave the Swiss made watches a distinctly imperial feel, and the clever juxtaposition of Swiss precision engineering and an Empire brand name was a hit. By the mid-1930s, the company estimated that 100,000 of its Queen Anne model alone were being worn in India. The most famous supplier to West End is undoubtedly the Longines. The Swiss base of West End was located in St-Imier, not far from Longines and it seems that Jacques-Arnold Amstutz had a good relationship with Longines. From the early 1910s Longines supplied watches to West End branded with the West End name and logo, the only company in the world to which this privilege was granted and which contributed significantly to West End's reputation. In the 1950s the management of Longines reconsidered this arrangement and from 1955 only watches with Longines branding were supplied to West End. In 1934 two events occurred that had a significant effect on the subsequent history of the company. Bernard Taubert offered them the Decagonal cases with 10 flat screwed backs and cork sealing in the winding stems, which he guaranteed 100% waterproof, and Georges Braunschweig of La Chaux-de-Fonds offered the company the Incabloc shock resisting system for protecting the balance staff from breakage. The extracts shown here from the memoirs of M. Foëx, managing director of the West End Watch company from 1916 to 1973, were supplied to me by M. Jérôme Monnat, the current CEO of West End Watch Co.
M. Foëx relates how Bernard Taubert and Georges Braunschweig sold their respective waterproof watch case and shock protection system to the West End Watch Company in November 1934. West End immediately, on 12 November, ordered watches with Incabloc shockproofing and Taubert Decagonal cases from Lavina, who made the movements and assembled the watches. Lavina was founded in 1852. In 1928 they advertised as Lavina, Dubois-Peseux & Cie, with factories at La Chaux-de-Fonds and Villeret, offering good quality lever watches from 10½ to 20 lignes. The West End Watch Co. thus became one of the first companies to make watches that were waterproof and had the Incabloc shock resisting system. For their market in India and the Far East West End used the brand name Sowar on their watches, which means 'one who rides' in Persian and was adopted as the name of cavalry troops in India. The shockproof and waterproof versions were called in addition "Prima". The Sowar Prima became West End's most successful model. The West End Watch Co. used Taubert's waterproof Decagonal watch case with the cork stem sealing and 10 flat screw case back from 1934 until 1954, when Taubert were no longer able to keep up with West End's demand, which by then had risen to more than 2,000 case per month. The lifetime of Swiss patents in the 1920s and 1930s was normally 15 years, so by 1954 the Taubert patents for the cork seal and Decagonal case had long since expired. West End asked the Donzé to copy Taubert's cases which, after some hesitation, they manage to do, complete with cork sealing and 10 flat screwed case back. M. Foëx remarks We are saved. The exploded view of a West End Sowar Prima here shows how the watch was assembled using a Taubert Decagonal case. The movement, complete with dial and hands, is first dropped into the carrier ring and secured by the two case screws. The carrier ring is then inserted into the case from the back. The winding stem is then inserted through the stem tube, where the cork seal is already in place, and is secured into the movement by tightening the setting lever screw. With the movement and carrier ring in the case, the inner cover or cuvette then fits over the lower end of the carrier ring. The case back is then screwed into place and it contacts the small dimple in the centre of the cuvette, holding it, the carrier ring and the movement firmly in place. The case back has 10 flats, hence the name Decagonal, which are gripped by the key used to tightening the back down onto a lead gasket. The lead gasket is not shown in the picture, it is already installed in the main part of the case at the bottom of the threads that the case back screws into. The effectiveness of the Taubert Decagonal case is shown by the fact that although this particular West End Watch Co. watch has had a fairly tough life, probably in India because the inner cover has the mark "CS(I)" for the Civil Service in India, the movement is as clean and crisp and bright as the day it left the factory. 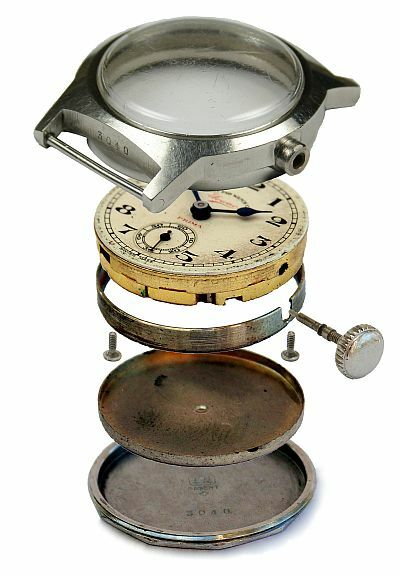 The West End Watch Co became thus one of the first company to use the Incabloc shock resisting system in their watches, and they used Taubert's waterproof Decagonal watch case with the cork stem sealing and screw back from 1934 until 1954, when Taubert were no longer able to keep up with West End's demand, which by then had risen to more than 2,000 case per month. 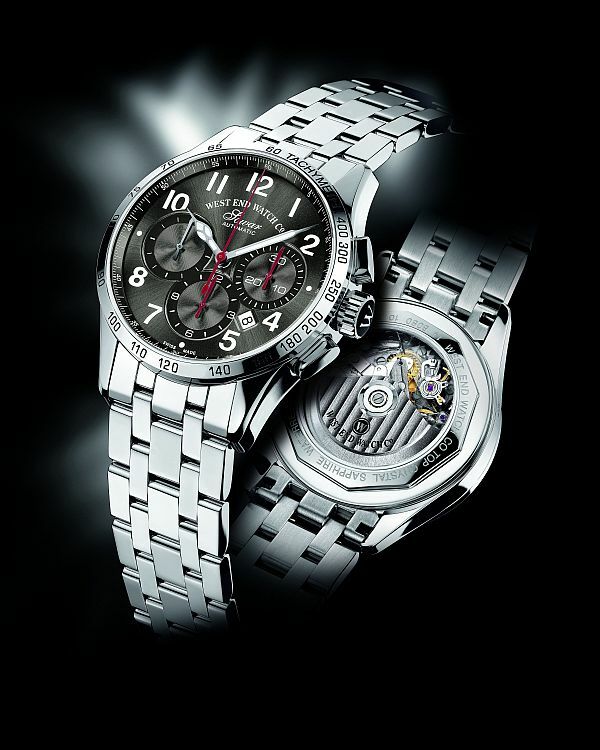 Similar to the arrangement with Longines, Mido supplied Multifort watches to be sold in India, produced by Mido with West End trade marks and logos. These watches were marked on the dial "West End Multifort". Mido stopped selling watches to West End in 1951 because they wished to distribute watches in India on their own. West End had business relationships with many Swiss companies. During the interwar period these included Juillard of Cortébert (Cortébert Watch), Leonidas of Saint-Imier, Marc Favre in Cormoret and Bienne, Brack (who became Lavina) at Villeret, Sauter Frères & Co. in Biel as well as watch factories such as Schwob Frères & Co. in Tavannes (Cyma and Tavannes), Charles Tissot & Fils in Le Locle, Thommen in Waldenburg, Mido in Biel and Aubry Frères SA in Noirmont. The West End Watch Co. is still flourishing today, with 15 million watches having been sold throughout the world during more than 120 years of uninterrupted activity since its creation. West End is today one of the most highly esteemed Swiss watch brand names in the world, especially in India, the Middle East and China. And their watch cases still have Decagonal 10 flat screw backs. I didn't realise this until I contacted the company seeking information about their links with the Tauberts, and M. Jérôme Monnat, CEO of West End Watch Co. informed me that since the 1930s, West End has never ceased using the Borgel/Taubert case back! M. Monnat was interested to learn of the Taubert connection and remarked to me that I remember having had to "fight" against one of my major distributors in Asia which was asking us to renounce in using the Decagonal case back in order to reduce cost. It was 5-6 years ago. I had told him that this was part of our heritage and a kind of trademark for our brand, without knowing of the Borgel/Taubert story. Thank you very much for informing us of this significant historical technical feature. It is giving us a new perspective and reinforce our conviction to use Decagonal case backs. The picture here shows a watch from the current range, still proudly bearing the name Sowar, and with a Decagonal case back descended directly from the original Taubert design. This one has a sapphire crystal window in the centre which the Tauberts never used, but I am sure they would have approved.